The newspaper is in a deep financial crisis, with an annual loss of €1.5 million in 2013, due largely to steep decline in print sales. The employees rejected a savings plan including a 10% cut on salaries in January, and went on strike on Friday the 7th of February (no edition of the newspaper this day). This hub would be open to all, journalists, artists, writers, philosophers, politicians, designers, and would be totally dedicated to the “Libération” brand. 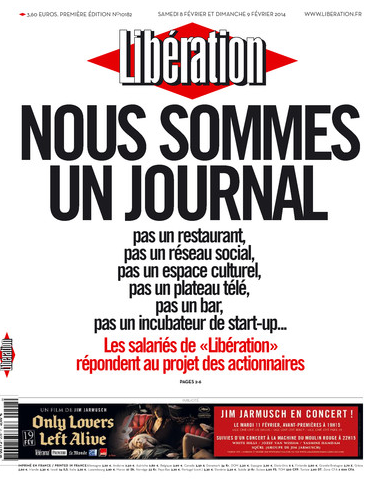 The newsroom rejects the plan, condemning the lack of dialogue and of reference to the historical values of the newspaper, the unique focus on “monetization”, with no reference to news, journalism or information.